May 29, 2011 Daily Photo. 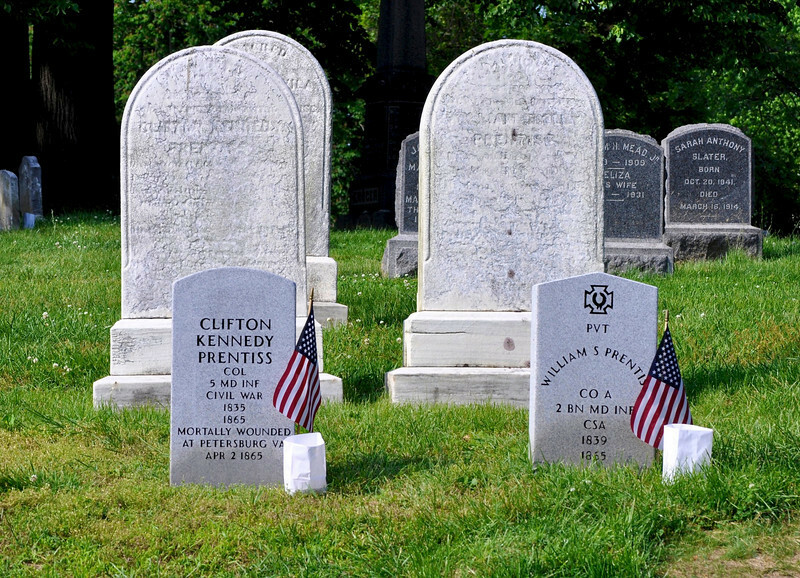 I noticed these grave markers on a walk through Green-Wood Cemetery today and noticed the same surname and then I saw they both were in Maryland units and then I saw the CSA (Confederate States of America) on William's grave. I immediately wondered if they really were brothers and on opposite sides in the Civil War. William's grave also has a confederate cross on his grave stone. I later read at an exhibit set up in the Chapel marking the 150th year of the beginning of the Civil War that indeed they were brothers and the Union brother Clifton led the attack on the position held by his brother's battalion at Petersburg. William died shortly after the battle and Clifton held on for two months. They grew up in Maryland but Clifton was living in Brooklyn. He buried his brother and then he was buried next to him. Their original markers are behind the new ones. I am puzzled frankly why William's grave has an American flag since he died fighting against the USA. There was an event later tonight honoring the Civil War veterans buried at Green-Wood. Apparently there is good number of both sides buried there, but a far greater number of Union veterans. Great photo and story. A family member on my father's side and one on my mother's fought on opposite sides. But not in the same battle and it is unlikely that they would have met. A tragic period in our national history. Fantastic capture and there are many stories of those in the same family on both sides. Look up the story of "Taps" played at all military services. You night be surprised. Very interesting, that's for sharing - it is a mystery, but I'm glad to see that the brothers are together here. Interesting capture, I think it's nice to have brothers buried together. wonderful capture and very interesting information. Nice tribute................very moving commentary regarding these brothers!!! !